Even though I’ve lived a majority of my life in Australia, I still love South Africa, and this tutorial was inspired by that love! 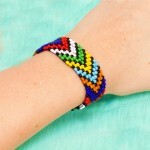 I hope you all enjoy that tutorial on how to use a loom and make a beautiful bracelet! Creative souls sure know how to save money! Making your own beading looms is one way as you can see from these tutorials. All you need is a suitable box! Using a loom sure speeds up beaded bracelet making. The above super design by Ren of All The Good Girls Go to Heaven blog was created using a tissue box loom! Her tutorial shows you how to make a box work. If your looking to start looming always remember to not pull the thread tight at any time, even when finishing the threads off. In the vid tutorial, she specified not to pull tight since the piece would tighten up over time. Of course, I didn’t listen and next thing I knew I had a crooked warped bracelet So I tried again, without tightening the threads and I was happy to see the piece lay flat and flexible. When my grandmother lived near me, every week she would come over and teach me how to make something new. Whether it is was knitting, painting, or (today`s tutorial) beading on a loom. The loom I am using is small. The most common thing to make is necklaces, bracelets and belts. I thought starting small would be a good idea, just beading a 6×6 square or two, and then I realised that I hadn’t left much length on the threads to be sewn in and there were going to be more bits of thread than beads in the finished product. But that didn’t stop me as I had an idea forming, take the little squares and put them on lengths of silver chain, what could be more summery than that?